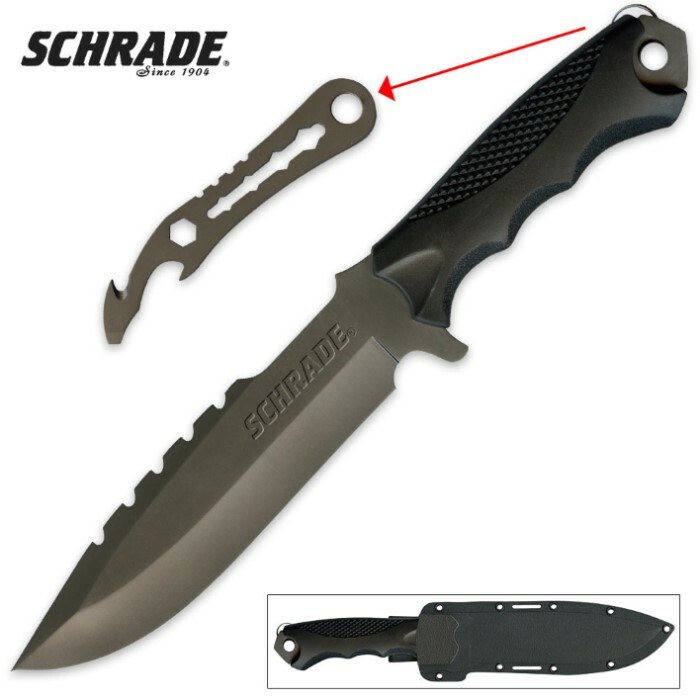 Schrade Extreme Survival Titanium Knife And Pry Tool | BUDK.com - Knives & Swords At The Lowest Prices! Schrade's Extreme Survival Knfie And Pry Tool packs tons of convenience and functionality into one 11 1/2" knife. The titanium-coated high carbon stainless steel hollow ground blade is razor sharp with heavy-duty serrations on its backside and a removable pry tool with a locking pin lanyard. 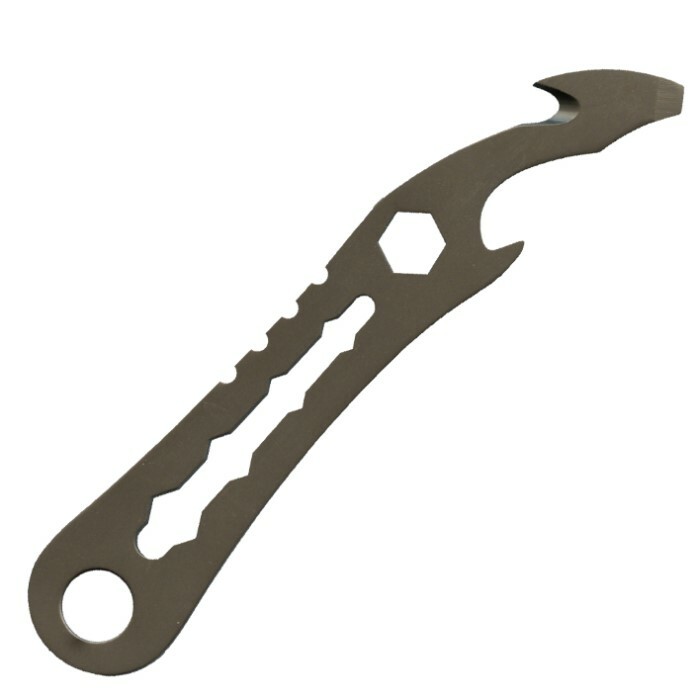 The pry tool offers many features: a bottle opener, 1/4" hex wrench, wrench driver, flathead screwdriver, and strap cutter. Includes a multifunctional nylon glass filled fiber belt sheath. 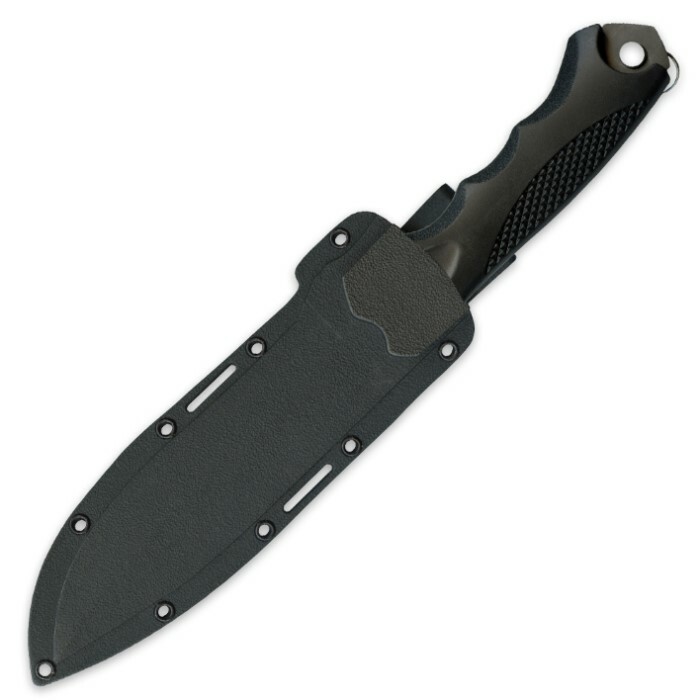 I've been looking for a great all-around tactical fighting blade and I finally found it -- The Schrade SCHF27. As an infantry officer in the Army, I carried a tactical blade for many years that I purchased when I was a young 2nd Lt. Sometime after I left the army I lost the blade which had become my trusted companion. Although I have owned several knives since then, I never found one that I liked -- UNTIL NOW. Scanning the BUDK catalog I came across this knife and after reading the description, watching the video, and scanning the reviews, I ordered one. From the moment I opened the box and pulled the blade out of the scabbard, I knew I had found what I had been longing for. This blade is well designed, very well balance, and just plain feels great in my hand as if it were a natural extension of my hand. I LOVE IT. I had considered purchasing other blades that were much more expensive and for a good blade I willing to pay the $$. But, for the price I paid for my SCHF27, I'm extremely pleased. This is one of the best tactical blades you will find at any price range. Despite what is written here, mine was out of the bubble pack with a decent edge and sharpened up nicely holding the edge well. I've used it camping without issues, but it is really an urban-oriented tool. The sheath works well, holds nicely-but agreed it isn't for over the mountain terrain long trip use. Light and easy to move around, this knife could very well be your best friend on a dark night. I was a little worried after I bought this knife. I wasn't sure It would be worth the 30 dollars or not, but after I received it that feeling was gone. Even though it wasn't sharp, the sheath was terrible, and the serrations on the back were purely cosmetic.. this knife was worth the 30 dollars. It's very durable, and lighter than a few of my others. Just keep low standards for the sheath, and have your wet stone somewhere close if you're taking it out. The tool in the handle is pretty worthless, the cutter hook won't cut anything. Not bungee cord, jeans, or even a worn out cotton shirt. But as a survival in mind kind of thing it's better than nothing. "Decent knife, very light weight"
This is a nice knife, no doubt about that. High quality materials, nice sheath. The tool on the inside can easily be removed as well as the push button and attached to a keychain. However for its size, this knife is very light weight. I think its like 8oz. I believe that's way too light for a 12 inch stainless steel blade. However, it's hollow grind, straight edge, 90 degree spine cut out make it an ideal bushcraft knife. If you're looking for a big, lightweight bushcraft knife, look no further. Also, people say they can find a use for the ridges on the spine, but I feel they're useful for crushing, along with the pommel. Just got the knife in today and I like it! Full-tang blade and about 6.5" long. The edge of the knife was good right out of the box. Not hair shaving sharp but a few passes of the stone will fix that. The pin that holds the tool in place can actually be removed if you don't want the tool in the knife. Other than that it just makes some noise from the ring on it. The blade stays pretty well locked in the sheath you would be able to do an upside down carry. My only beef with this knife is that the handle is kind of small for large hands like mine.